An old friend of mine touched base on Facebook and asked ... "Does anyone remember getting a new pair of shoes for first day of school?" Hell, yeah!! 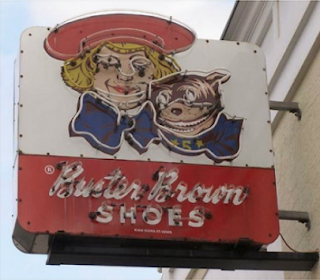 For eons, my father was an exec with Brown Shoe Company in St. Louis. (They even named a sporty shoe after him called "The Kogey.") In our household, it was boo-hiss on Stride Rite shoes. * Leather loafers with a kilt on the vamp. * Brown leather loafer-style shoes with a buckled strap. ... and their twin for later in the week: blue leather ties. * And might I add ... "slip-ons" at the time were considered trashy. We won't even touch the subject of Zorries. 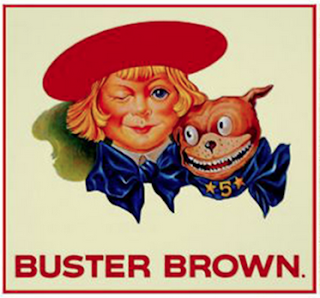 Buster Brown and his dog, Tige, reigned mighty in my Maplewood childhood. Click here for the kitschy and catchy 34-second jingle that is burnished in my memory. This, along with my father (and very stylish mother) kindled my forever-love for shoes. I'm a full-believer in the phrase, "You can always tell a person by the shoes they wear." In our next chapter, we will discuss the importance of wearing polished shoes and what it means if the tips and heals are scuffed. Not good.